Leave Your Elf on its Shelf and Use the Shepherd’s Treasure Instead! Our kids were already pretty big by the time Elf on the Shelf became a thing, so we never got one for our family. It’s a fun idea, sure, but can I tell you about something that is about a million times better? You must check out The Shepherd’s Treasure as a new Christmas tradition for your family!!! I don’t even care that most of my kids are over 6-feet tall. This is the coolest and I want to at least enjoy the idea of it with them as we prepare for the Christmas season. Instead of an elf, your family can take part in the adventure of a shepherd boy on a journey. Who is he in search of? Jesus, of course. There is a beautiful picture book, created by Stephanie Parker, that comes in The Shepherd’s Treasure set. It’s perfect to read with your family as you start your Jesus-seeking adventure with your shepherd this December. Each night, the shepherd can be moved so that your kids can discover him in the morning. He’ll provide your family with a new card to read, which offers scripture and service ideas or activities to read and participate in. Did I tell you I love this? I really, really love this. 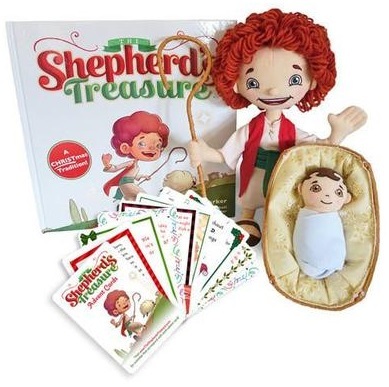 Stephanie, the creator of The Shepherd’s Treasure is providing us all with a discount code HeavenlyHomemakers which gets us all a $10 discount on The Shepherd’s Treasure Book/Doll Set with Advent Cards! That is a HUGE discount considering the entire set of high quality products is such a reasonable price. What a fantastic opportunity for all of us! I’m thankful for wonderful options like this for families to help us enjoy fun Christmas traditions while keeping Jesus as the center of our celebrations. Want to win The Shepherd’s Treasure complete box set for your family? Enter to win in the Rafflecopter below. I’ll draw a random winner on Monday, November 21. This looks great. Thanks so much for bringing things like this to our attention, Laura. I saw this the other day and totally wanted it. I would love to win one since I know I can’t afford it this year! My boys would have so much fun with this!!! Sounds like a neat idea for Christmas! Love this idea for my 3 year old! Thank you for making this product known. What a beautiful idea! I had no idea this existed. I LOVE it! I absolutely love this! Weve always done the Elf on the shelf, this is such a better alternative!! I have 4 kids ages 6-13 so this would still be great for years in our home! I love this! We used Star from Afar last year, but I think my girls would love this Shepherd even more. I’d never heard of this. How cute and fun!! What a great idea! I would love to do this with my kids! What a fun idea! We currently love using The Advent book, but this could be another intentional Christmas tradition to point us towards the true meaning of Christmas! What a beautiful tradition to start with your family! What a great idea! Thanks for the chance to win. I’ve never been a big fan of the Elf. This looks awesome! Thank you for the giveaway! Thanks for sharing. I’ve never been excited about Elf on a Shelf, but this is something I could see us doing! I LOVE this! My son’s friends and cousins do elf on the shelf and have so much fun with it. I have been uncomfortable with the message it might send, but I love the fun they have with it. I am so excited that there is a great alternative that is purposeful! What a great idea!! 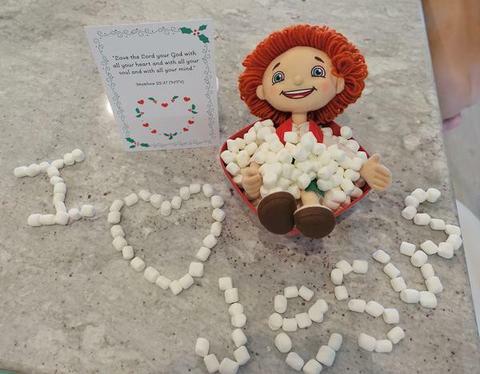 I have always thought the Elf thing was a little creepy….this is a neat alternative!! This looks fabulous! I have never understood the elf on the shelf. Seems like he is left doing naughty things but the kids are supposed to be good, doesn’t make sense to me. We haven’t done elf on the shelf , but The Shepherd’s Treasure is something I feel is more up our alley! What an awesome idea, thanks for the suggestion! That looks very interesting! Thanks! I’ve resisted “elf in the shelf” because of it being very un-Christ-centered. Also because Santa is not a big thing in our house. But then I felt bad because “all the cool moms are doing it”. This is an amazing alternative! I love this idea! Not a fan of elf on the shelf but this is great! Thank you for sharing! I’ve been looking for something like this! Wow, what a neat, neat idea! Thanks for sharing with us! I love this idea. I never liked the elf on the shelf’s naughtiness. I love this! 100x better than elf on the shelf! Would love to win this! Always trying to find ways to make Jesus the center of Christmas ???? How precious! Although I wanted to, I never could get into the spirit of elf on the shelf. What a great, fun alternative! I love advent calendars for the same reason, but they’re always filled with sugary sweets. I love that this one will give us one focus verse for the day and lots of ideas of how to apply it. Great idea. I’d love to win one for the fam!!! My little ones would love this. I love how it’s a Jesus centered alternative to Elf on the Shelf!!!! What a great idea. Thanks so much for the giveaway! Love that is Christ centered instead of an elf. What a wonderful idea! I would love to win this to share with my 3 littles. Thank you! Brilliant Idea! I’d LOVE to win this! Thank you for the giveaway! I have been looking for a new advent! What a great idea! Thanks Laura! Cool! I would love this. We used to do the Advent book series by Arnold Ytreeide (Jotham’s Journey is the first one). We did those too! They were awesome! This would best much fun to do with the kids! My 3 little girls would just love this! I am so glad someone came up with an alternative to the elf on the shelf. Looks like fun! Was thinking about getting my son an elf, this looks like a great alternative. Laura! I’m so interested in this! I love the fun of it! And the heart!!! I can’t wait to get one for my kids! What a great way to point kids and families to Christ during this Christmas season! This looks like such a cute idea! My oldest is almost 5 and we haven’t started the Elf tradition yet because I just wasn’t quite sure it totally represented Christmas the way we wanted our children to see it. I can’t wait to try this out instead! Just ordered mine!!! So excited! I love this idea. I have a nine year old grandson that lives with me and I think this is a great idea to keep Jesus as the center of Christmas. My littles would thoroughly enjoy this! Thank you for sharing this, Laura. It would be such a blessing for our family. My boys keep asking to do Elf on the Shelf and I refuse every year even though it is the popular thing. They ask why and I tell them that we put our faith first and Christmas is about Christ. This would be such a great way to add to our home and our Christmas. This is such a cool idea! Love it!! Our family has chosen not to do santa. I think this would make a great alternative! What a great idea and neat product! Thanks for sharing this. I prefer this to the elf, and I think that my kids would really enjoy it. I love and this idea! It is so very important to teach our children (and grandchildren) the true meaning of Christmas! Can’t wait to add this to our family’s Christmas tradition. I would love to win this for my little nephews. Brilliant! I love this so much! This sounds like a wonderful alternative to the Elf on the Shelf! This would be a great gift for my cousin’s child for when he visits me and wants to watch TV. Would love another reason to keep Christ in the season. I have tried to think of a Christian elf on the shelf idea for a while. Excited to see someone did and hope it is a hit. Looks wonderful. What a fun idea to promote reason for season! How fun!! I love this alternative. I love this idea! What Christmas is really about! This is fantastic! I’ve been thinking about elf on the shelf but was torn. This is a great alternative. I’m so excited for our family to do this together this Christmas!